Last weekend I took four-year-old James and his cousin out to the beach house. We experienced all sorts of weather: snow, hail, rain, and sun. You hardly ever see an all rainy day at the beach. The weather sweeps through quickly and something new is just over the horizon. We had a very pleasant, kid-focused day on Sunday. First, we met Grandmother and Granddad at the Shilo Inn's restaurant for a breakfast buffet. The restaurant has a great view of the beach, and - this being January - we got our pick of the best tables. The grandparents had driven out from Lacey - just an hour away. Then we all drove down together to the Ocean Shores North Jetty - this is at the southern end of the Ocean Shores peninsula and bounds the north side of the entrance to the harbor. Behind the jetty is a wide, sandy beach. The sun came out just then for the next couple hours - it almost felt warm. 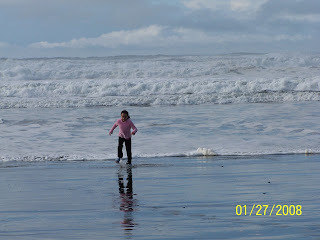 Raquel played in the surf, running from the waves and ruining her canvas shoes. James preferred to dig in the sand bank at the back of the beach. The beach also has a sand dune the kids liked to climb. Its slight elevation also improves the view. Next stop was the YMCA in Hoquiam for its indoor waterpark. There was a nice spot for the grandparents to sit and watch. The rest of us dove into the water attractions. We went first to the waterslide. James is an old hand at going down that alone. I almost had Raquel convinced to go on the slide - she has never learned to swim, but she backed out in the end. Raquel and James mostly played in the water-jet powered circular river and under the buckets that dump water on your head. James was tall enough on this visit to play in the river on his own. I should mention the Humdinger. It's a 30 year old hamburger joint in Hoquiam on highway 101. The kids made me stop there each time we passed - they have wonderful, thick milkshakes or "polars" - what Dairy Queen calls "blizzards".